Former petroleum minister Shahid Khaqan Abbasi on Tuesday took oath as the new prime minister of the country at the President House Islamabad. Abbasi took the oath of his office at a solemn ceremony, which had armed forces chiefs, governors, members of the parliament, and prominent political and social figures in presence. President Mamnoon Hussain administered the oath to Abbasi. He swept the election with a majority vote, securing 221 of 339 votes. Pakistan People’s Party (PPP)’s Naveed Qamar secured 47 votes, whereas Sheikh Rashid bagged 33. Jamaat-e-Islami’s Sahibzada Tariqullah managed to secure only four votes. He was elected as the new prime minister following the disqualification of Nawaz Sharif by the Supreme Court last week. “Four days ago, the Supreme Court verdict was completely embraced by us but not the public. The prime minister left the PM House after the verdict. There were no rifts in the party following the verdict,” he said, adding that democracy was not derailed and was now “back on track”. “Everyone wants the [prime minister’s] chair. Tell me, who in this house doesn’t? It is to the PML-N’s credit that all party members rallied unanimously behind whoever was nominated by our leader. “Within four days, the democratic process is back on track. There were no defections. There was no dissension in our ranks. “Justice mandates that though a 1,000 guilty people may go free, not even one innocent person should be wrongfully convicted. I will not delve into details of Friday’s decision; I only want to say that there will soon be another court—one held by the people, where there will be no JIT,” he said, referring to the upcoming elections. “Whether I am in power for 45 days or 45 hours, I will work as the prime minister of the country and will not mere hold the post,” he added. “There is not a single country in the world which allows the licencing of automatic rifles for citizens. If you go outside Parliament right now, you will see a private militia,” Abbasi remarked. “Action will be taken against them if my cabinet allows for it. The federal government will seize all automatic weapons, compensating people in return,” he promised. The new premier vowed to eliminate load shedding by November this year, as he highlighted various infrastructure and development projects initiated by PML-N as examples of its commitment to the country’s growth. “In Pakistan’s history, power projects with the capacity to generate 17,000MW were set up before our government. We have added 10,000MW,” he said. “Pervez Musharraf may have ruled the country for eight years, but show me just one major development project from that era,” he said. “One thing that is very close to my heart is [the collection of] taxes,” Abbasi continued. “The perception here is that paying taxes is optional […] if my cabinet approves, I will set my sights on non-taxpayers,” he promised. He also briefly mentioned a focus on agriculture, education and health services. “Agriculture is the backbone of the country,” Abbasi said. “Though I am not an agriculturalist, I feel their pain,” he said. Regarding education, the premier called for improvements in higher education and the need for a national testing mechanism. Major political parties had fielded their respective candidates for the premier slot. 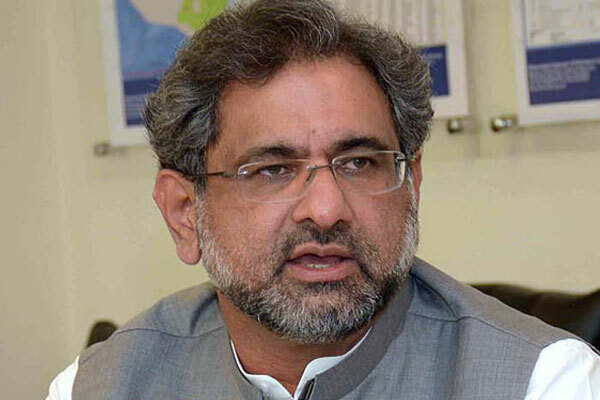 The ruling Pakistan Muslim League-Nawaz (PML-N) had nominated former petroleum minister and veteran politician Shahid Khaqan Abbasi as its candidate for prime minister. From the assembly’s second biggest party in terms of numbers, Pakistan Peoples Party (PPP), Naveed Qamar was contesting for the slot, whereas Pakistan Tehreek-e-Insaf (PTI) fielded Sheikh Rasheed as its nominee. The Muttahida Qaumi Movement-Pakistan (MQM-P), the assembly’s fourth largest party, voted for the PML-N candidate. The party had earlier nominated its MNA Kishwer Zehra for the slot but withdrew her nominated following a meeting with PML-N leaders. Jamaat-e-Islami fielded Sahibzada Tariqullah as their candidate for the new prime minister. The opposition intended to ‘put up a fight’, although the PML-N held a majority in the National Assembly. The opposition parties’ meeting on Monday failed to result in an agreement over a joint candidate. The winning candidate required 172 votes to win. After Abbasi’s speech, PPP’s Naveed Qamar was given the floor by the NA Speaker to share his remarks, where he thanked his party leadership for allowing him to be nominated for PM. “My advice to the prime minister-elect would be that the onus is on you. This seat has not been occupied very frequently in recent years and you will make it stronger if you continue to sit on it. Your power flows from this house, and if this house is strong, you will be strong,” he said. “You said you have 45 days, but I will insist that you have 10 months. How much change can you bring about in this time? You will only progress if you focus on two or three areas and take them forward,” he advised. “Prioritising agriculture will make the country stronger,” he said. AML’s Sheikh Rashid also congratulated Abbasi on becoming the prime minister-elect “through a democratic process”. Rashid, the second runner-up, also elaborated on shortcomings in the PML-N’s economic policy, including a $5 billion decrease in exports, an “unbelievable” $35bn loan, and unemployment of about 1 million people. It is vital to mention here that Abbasi will remain the PM until Punjab Chief Minister Shehbaz Sharif runs for NA-120, Lahore, the seat left vacant after Nawaz’s disqualification, and then take over as the new ‘permanent’ premier until the 2018 polls. Meanwhile, Shehbaz Sharif, former Prime Minister Nawaz Sharif’s recommendation for the premier’s post, has congratulated the interim prime minister for being elected. This man has embarrassed all Pakistanis. He is scum of the earth and a corrupt man with no dignity. He addressed like a disgraceful person . He is another crony and cohort of Nawaz Sharif, their partner in crime and a close member of the loot gang. There was an exhibition of two contrasting characters after the most amatuarish speech of Abbassi. One was of dignity and selfesteem and he was Mr Shah Mahmood Qureshi and the other of a street vendor and that was non other than the newly elected to the misfortune of PMLN Prime Minister. His speech and post speech conduct was an embarrassment .